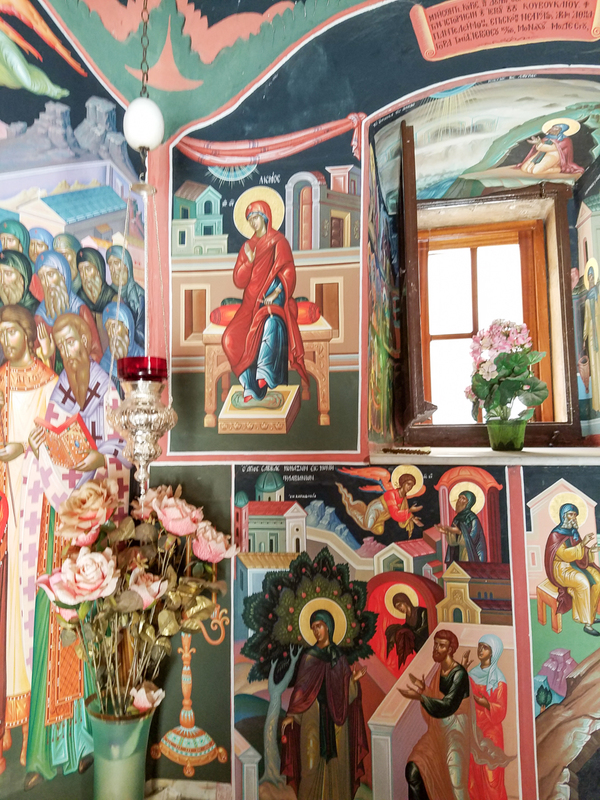 The Monastery at Saint Sabbas has been a place of monasticism for 1,500 years. 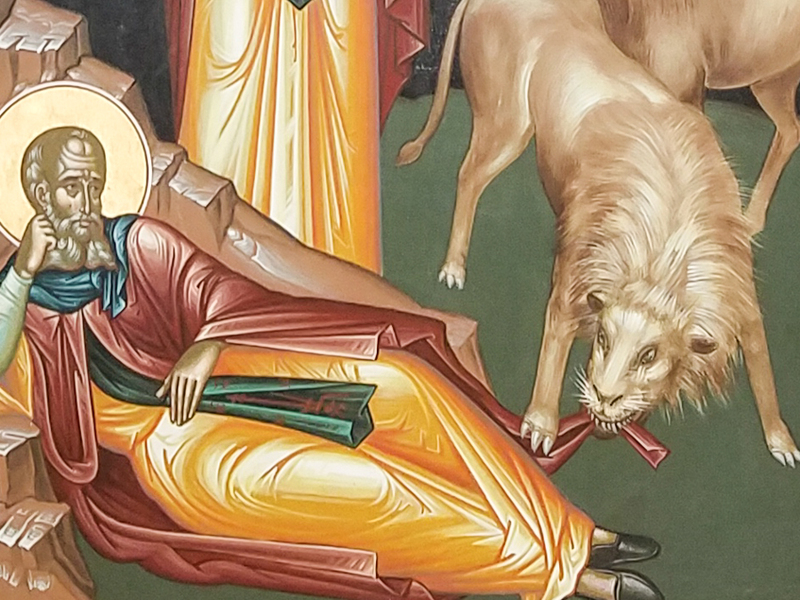 Saint Sabbas lived between 439 and 532. 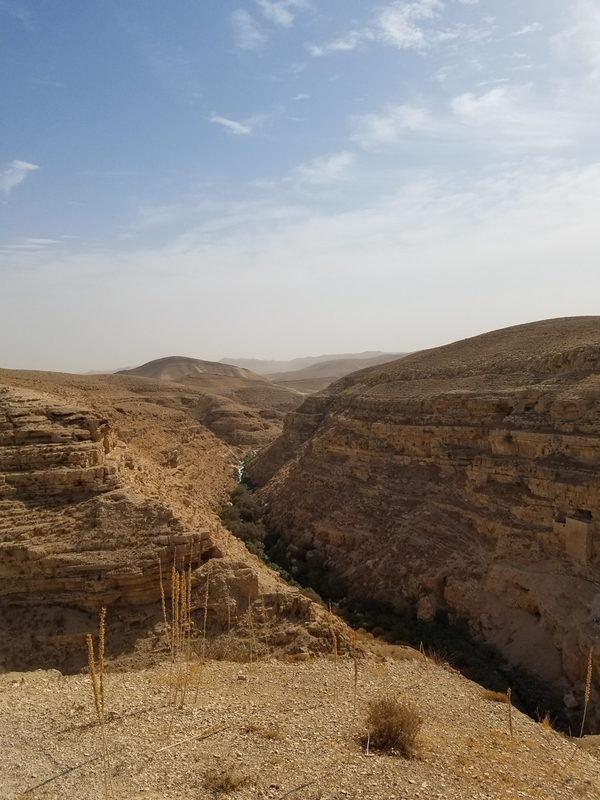 Note: towards the right is the Kidron Valley. 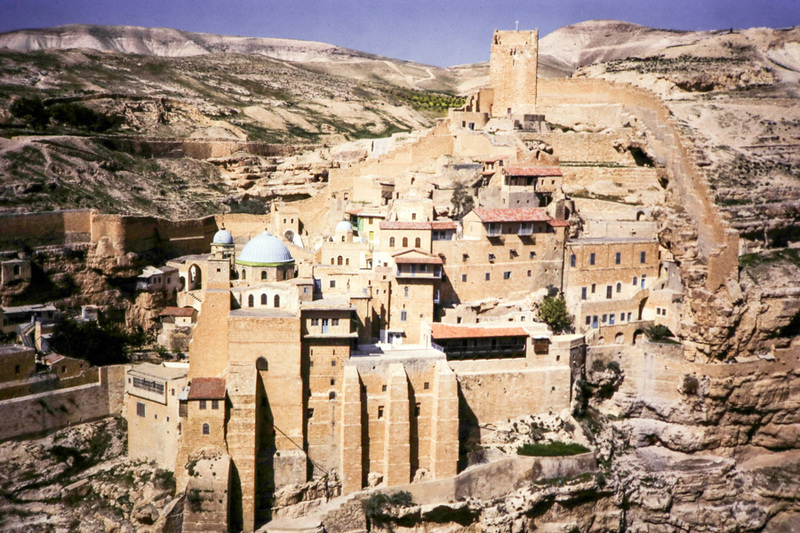 Mar Sabbas Monastery, photo taken in 1989. 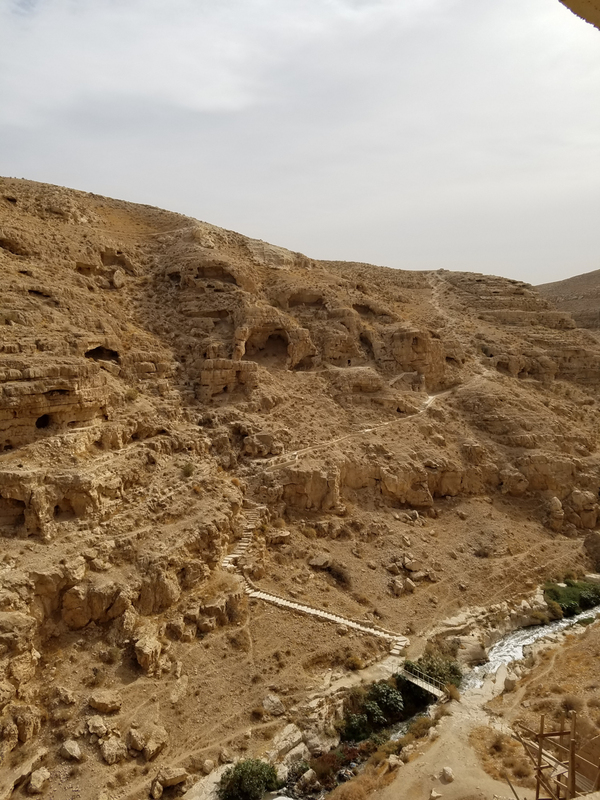 Looking down the Kidron Valley, one can get a glimpse of cave like structures where solitary monks lived. 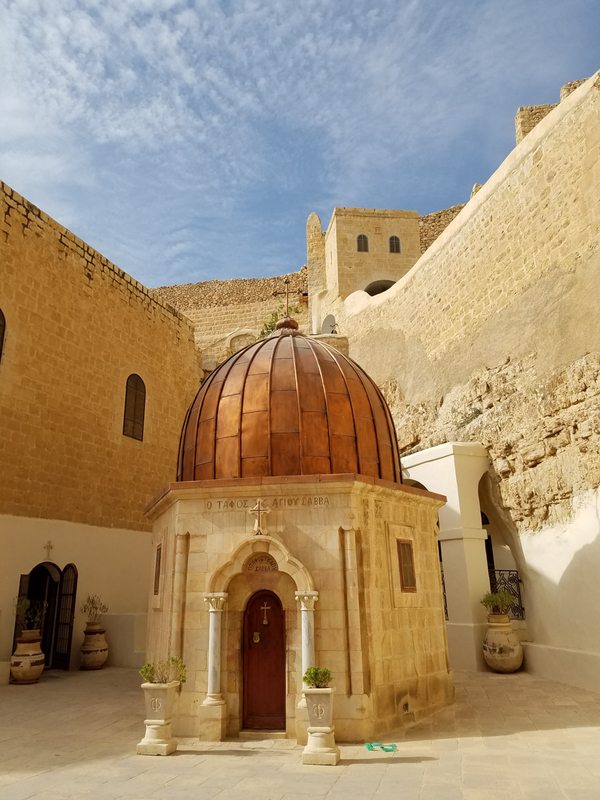 After the Muslim conquest in the 7th century, the monastery was reorganized and was followed by the Glorious Golden Age that encompassed part of the 8th and 9th centuries. View of one of the monastic chapels in the complex. 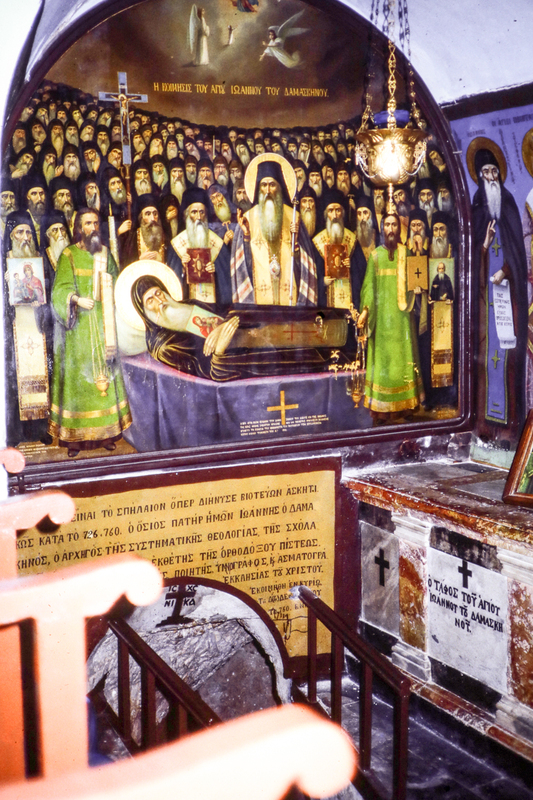 Tomb of Saint John of Damascus at the Monastery of Mar Saba taken in 1989. Today, no one is permitted to enter. 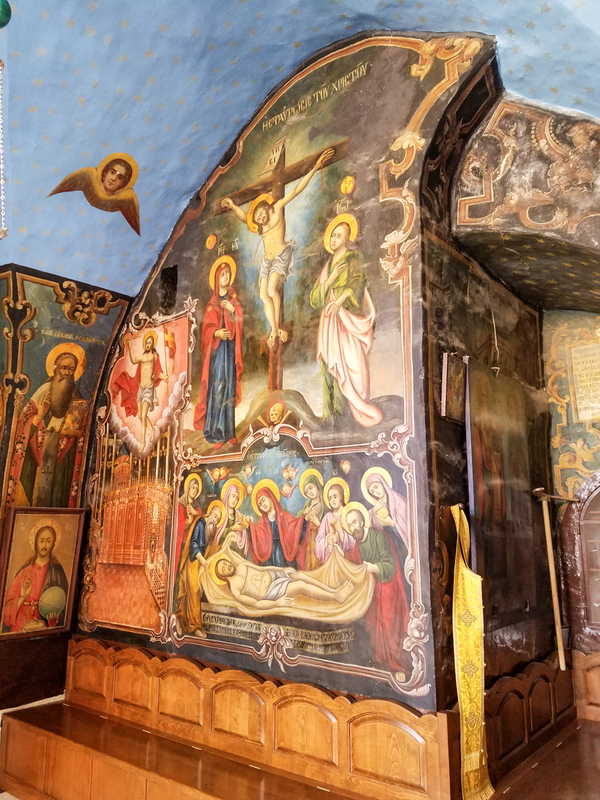 The tomb of Saint Sabbas. 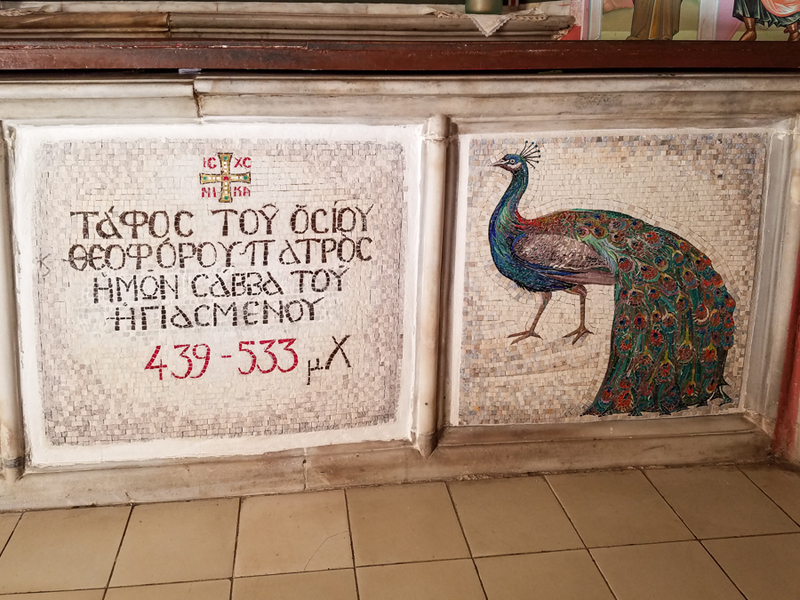 Notice the peacocks who symbolize eternal life. 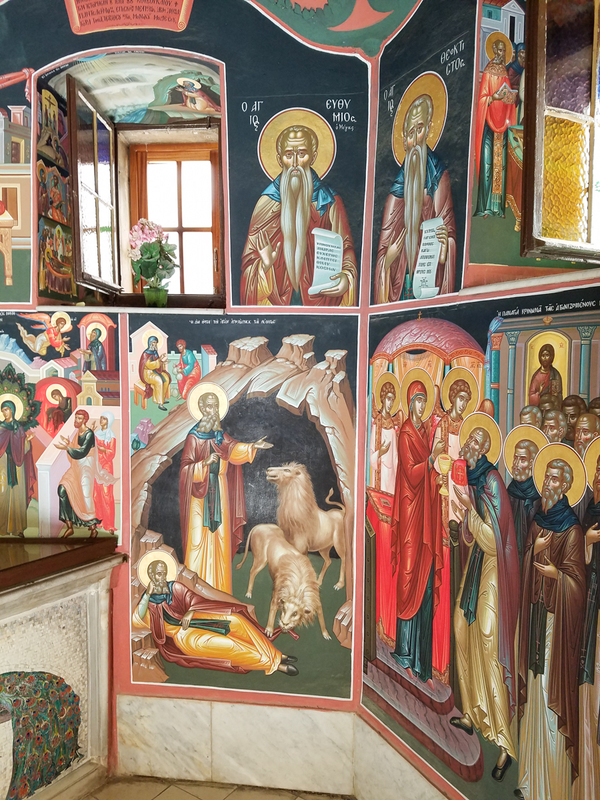 Inside the tomb are a series of frescoes dedicated to the life of Our Lord and Saint Sabbas. 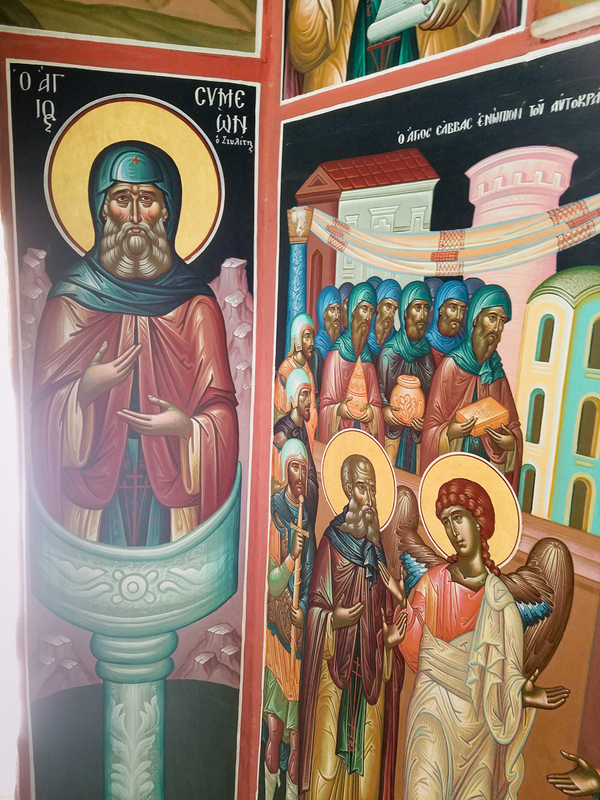 This fresco is dedicated to the transition of life of Saint Sabbas from the life of this world to the life of the world to come. 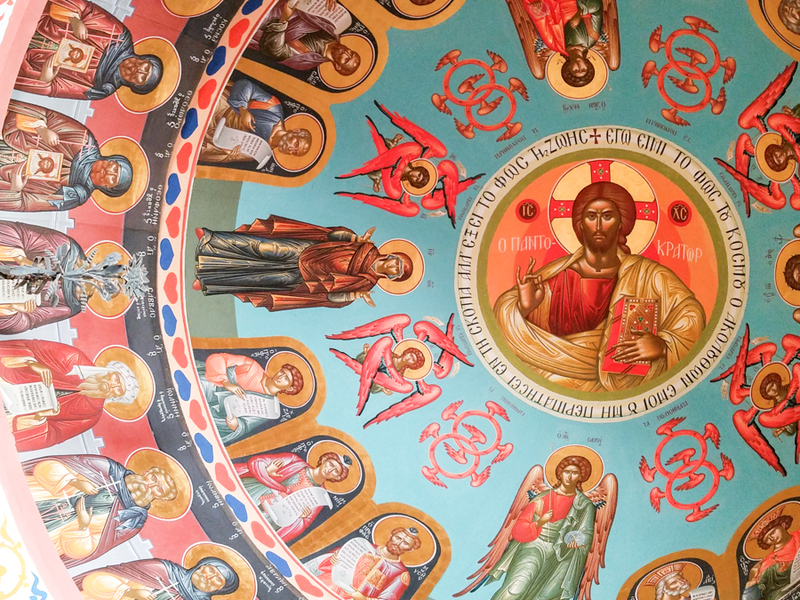 Gazing heavenward towards Christ Pantocrator whose presence overshadows the tomb. The Virgin Mary’s hands are extended in the orans position in prayers of intercession before her Son. The Virgin Mary is serving Holy Communion to the monks at the altar of her Son. Notice the beautiful rose canopy that overshadows the altar. 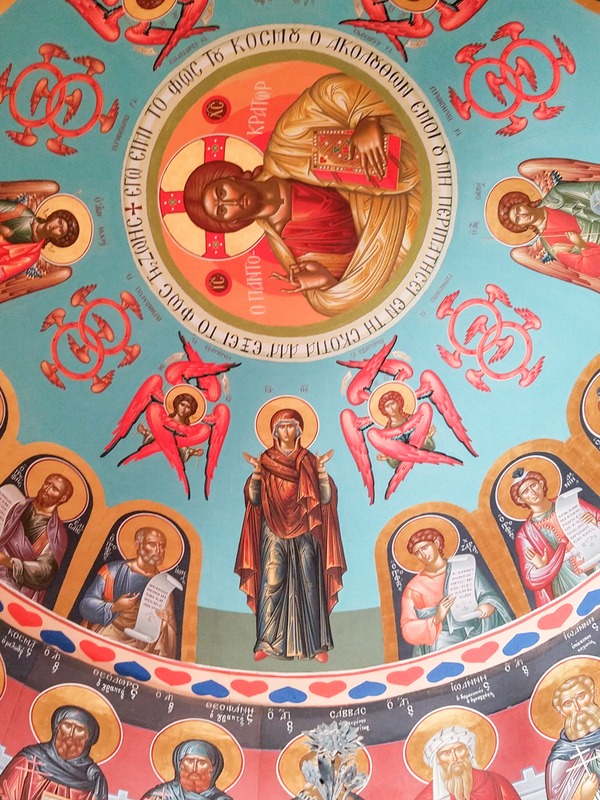 Note also how the dignity of the angels befits the sacrament of communion. Daniel in the lions’ den. 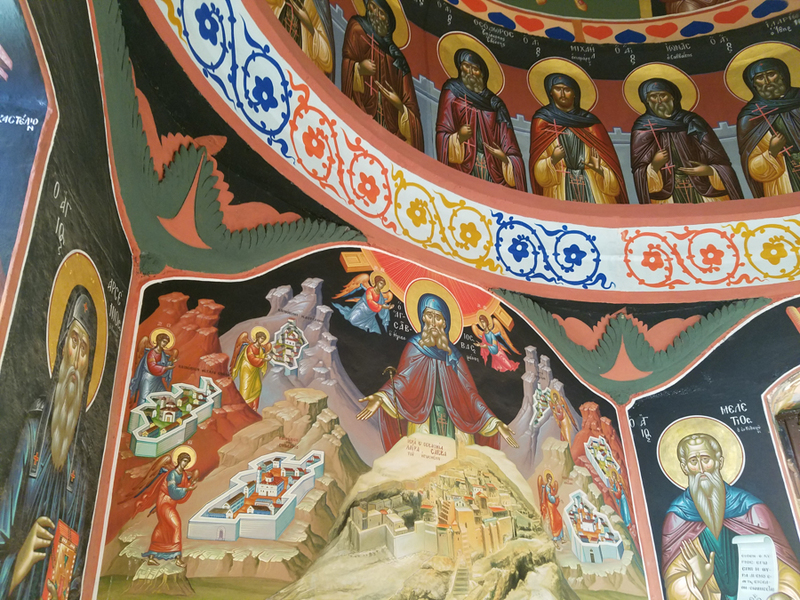 Saint Sabbas presiding over monastic establishments in the desert. 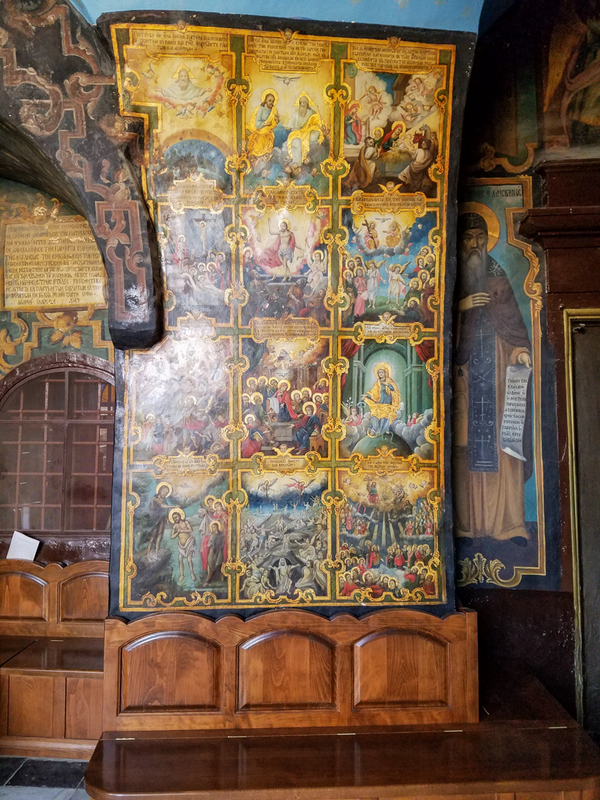 The Virgin Mary enthroned protects the monks of the monastery. 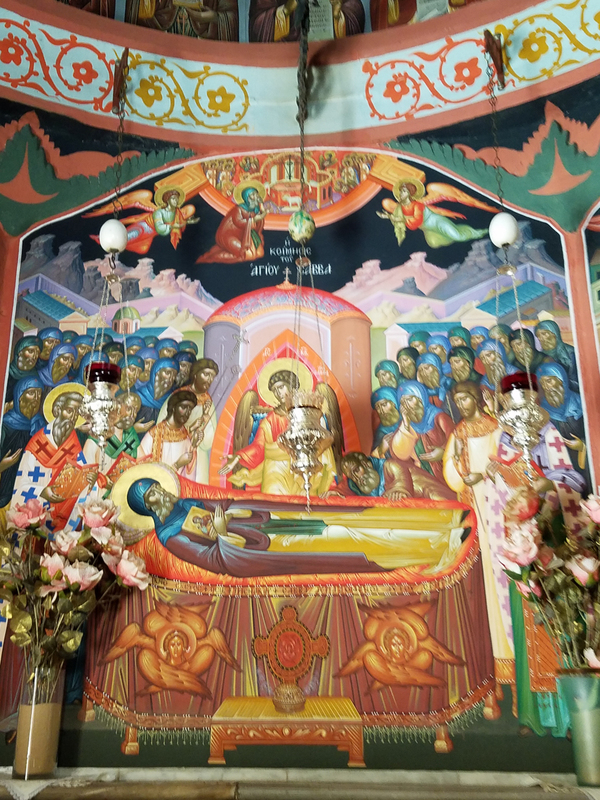 At the head of the tomb is an image of the birth of the Virgin Mary. 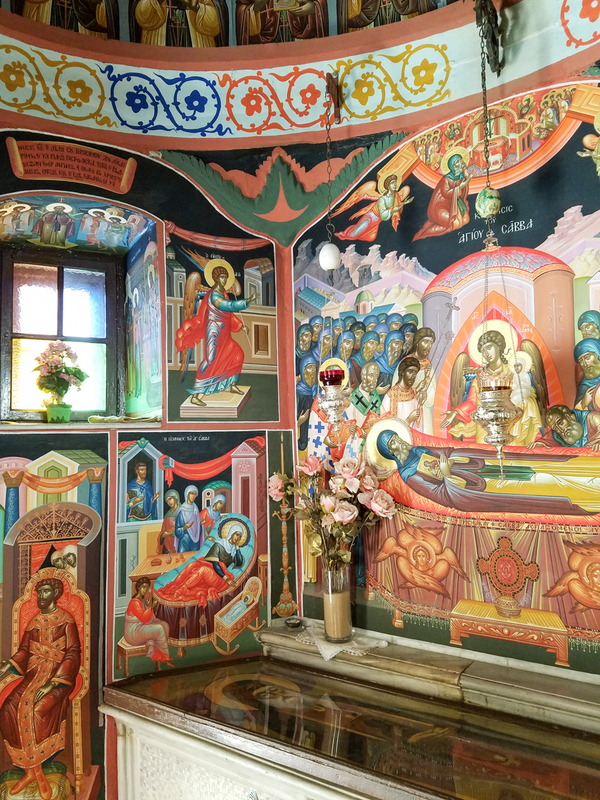 This chapel houses the mortal remains of Saint Sabbas. Fresco on cave wall that commemorates the crucifixion and burial of Christ. 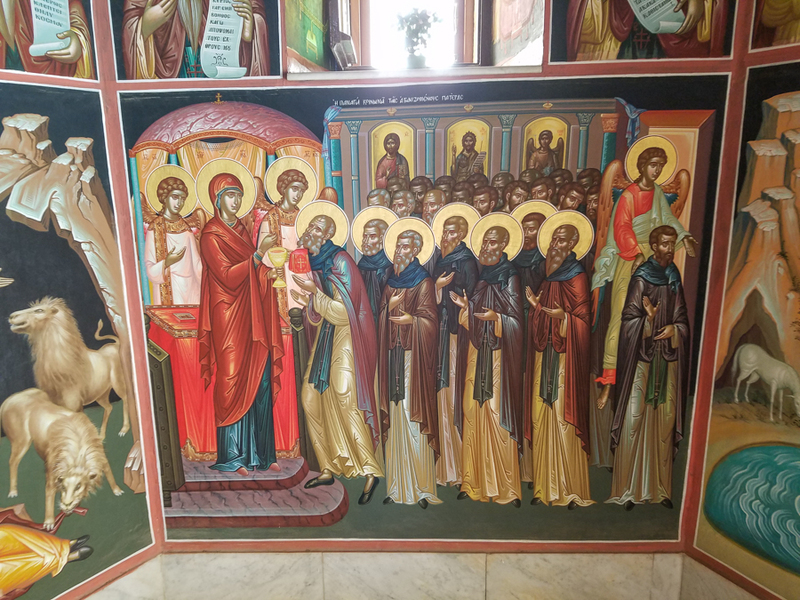 Saint John of Damascus defended the veneration of icons. 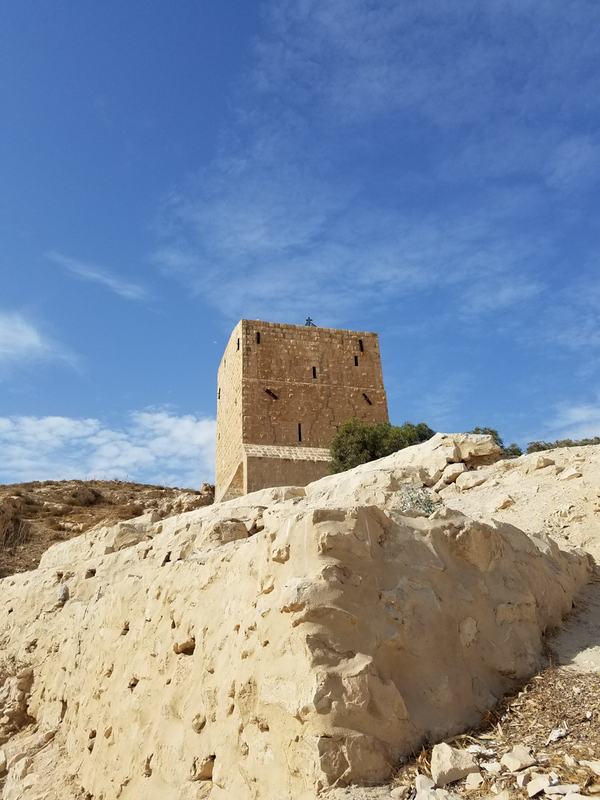 This monastery was also noted for the translation of church documents from Greek into Arabic. 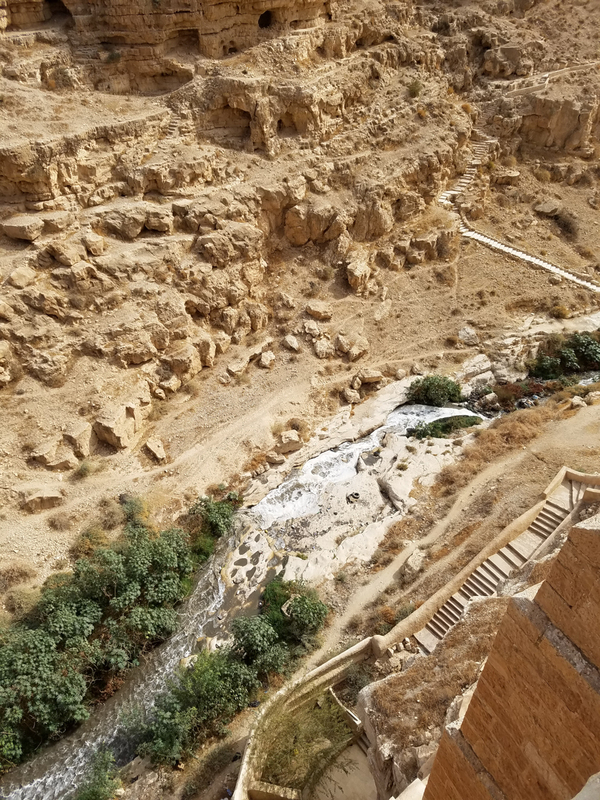 View from the monastery into the Kidron Valley. 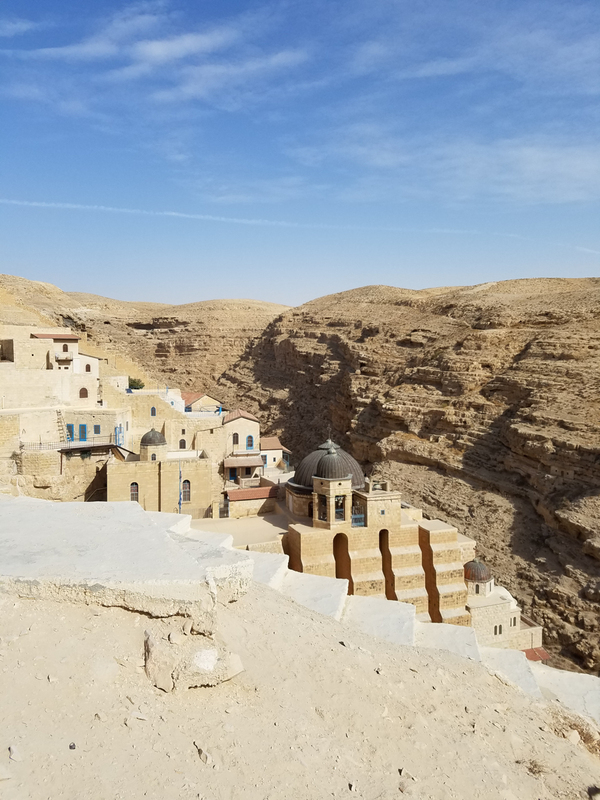 Overlooking the Kidron Valley from the monastery to the caves where solitary monks lived. 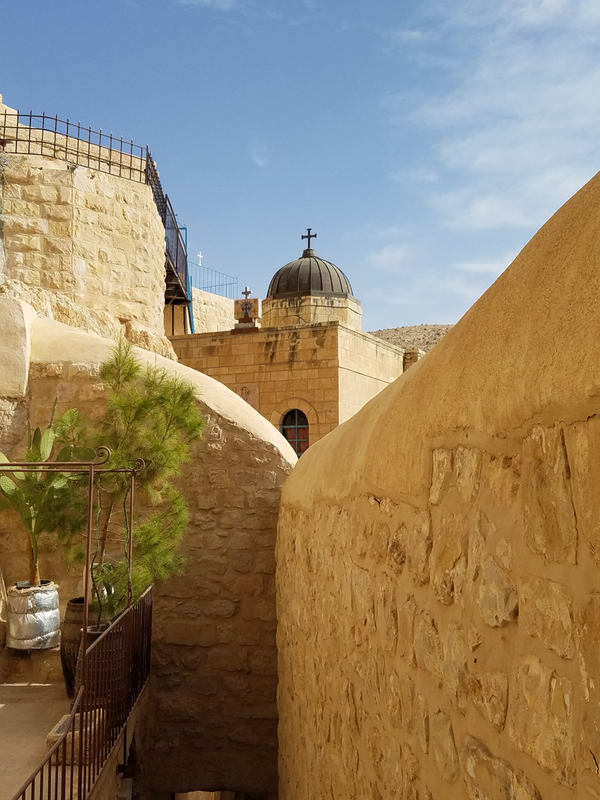 Looking up the Kidron Valley from the monastery. 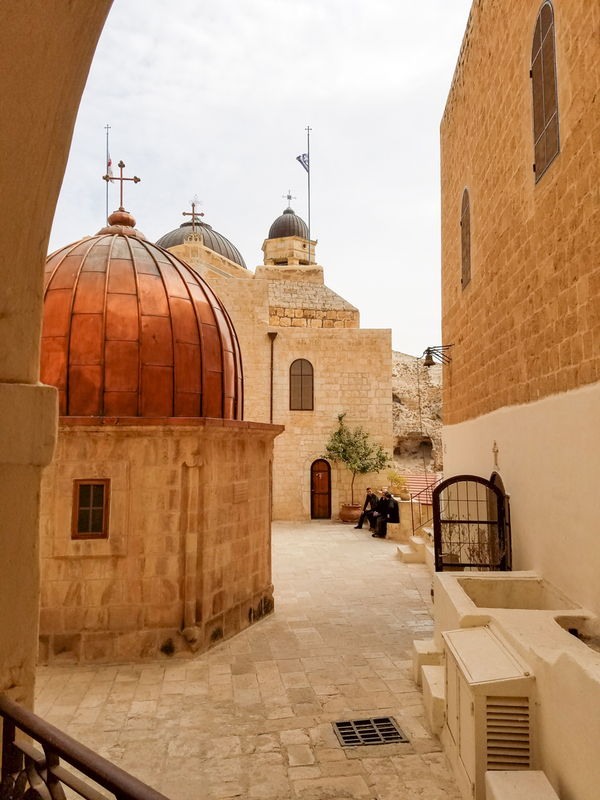 A beautiful view of the courtyard that surrounds the tomb of Saint Sabbas. 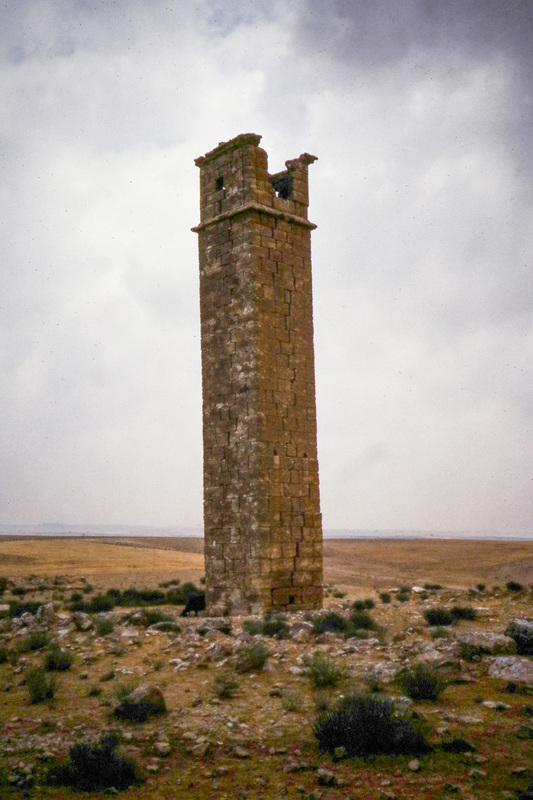 Stylite where they would live their lives in prayers. 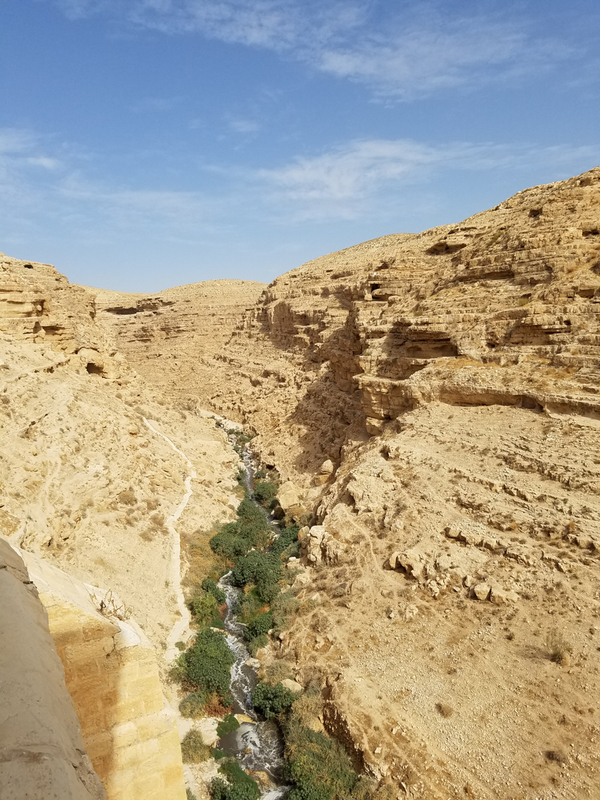 This entry was posted in Christianity and tagged Holy Land, Kidron Valley, Mar Saba, Monasteries, Saint Sabbas on April 5, 2017 by frjfkauffmann.